Kids Gym: Welcome To The Newest Gym For Kids! 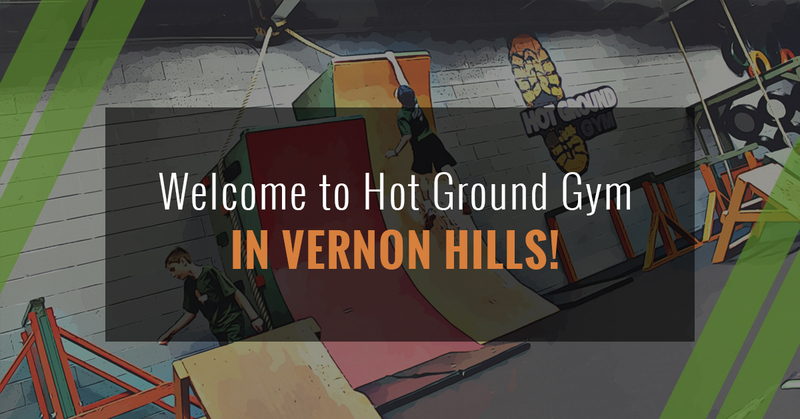 Welcome To Hot Ground Gym in Vernon Hills! We’d like to thank you for stopping by the new Hot Ground Gym website for Vernon HIlls. Our kids’ gym in Northbrook was such as success that now it’s time to expand, and Vernon Hills was the perfect spot. If you’re not familiar with Hot Ground Gym, we’re here to give you a quick rundown of what we do. It’s quite a lot, so let’s get to it! The heart and soul of Hot Ground is our gym. Our gym is built to resemble the many obstacles as seen in the American Ninja Warrior TV program; in fact, many of the structures you’ll find in our kids’ gym are the same type as those found on the show. Why have we chosen to model our gym for kids after ANW? To put it simply…it’s fun! We know that the more fun you make a kids’ fitness program, the more likely they are to enjoy it. Instead of complaining about exercise, most kids are chomping at the bit to come in and take a crack at our obstacles. These programs are called Junior Boots, and we have three different age groups that kids fit into: Kindergarten through 2nd grade, grades 3-5, and grades 6-8. One of the best parts about our kids’ gym is that kids work together in order to traverse the obstacles. It helps them learn teamwork and builds leadership skills, because everyone will play a part in getting though the structures. It also improves critical thinking, because the gym can change; Hot Ground can be altered in order to change up the order and number of obstacles that must be overcome. Junior Boots is an excellent activity for kids of Vernon Hills that gets them active and improves their mind. Find out more about plans, including free trials, right here. Looking for an amazing kids’ birthday party idea? You’ve found it at Hot Ground Gym! Let’s face it, many of the traditional birthday party ideas have played out. Too many parties are at bounce houses, and even high tech options like laser tag and game centers have been around for decades. That’s why we’ve come up with something new and exciting (and very active!) with our kids’ birthday parties. Unfortunately, kids can lose a lot of muscle and a lot of brain power during long breaks. That’s where kids’ summer camps and winter camps come in. Our camps are determined to give kids a wonderful time and have so much fun that they don’t even realize that they’re exercising body and mind. Camp kids will be given specific problems to solve and work as a team in order to figure them out. It’s a practical way to get their minds going when too many of their friends are vegging out in front of a glowing screen. But once they get moving, they’ll love the challenges we throw their way. Our 2017 Leadership Summer Camp is for girls and boys aged 8-14 who are looking to have the time of their lives. The camp runs from June 12th to August 4th and there are many plans available, from single days all the way to the full eight weeks. Check out the flyer for it right here. Now the kids’ obstacle courses can come to you! Hot Ground Gym also runs Go Obstacles, a mobile obstacle course that can be an excellent fundraiser. Schools, scout groups, and sports teams have all hosted us so that they can raise money for their particular group. It’s also an excellent option for field days during those last few days of elementary school, so call us today before May books up. Once again, we’re not just interested in letting kids have fun, even though that’s what happens every time! This kids’ obstacle course is modeled after our Junior Boots program, because it focuses on building teamwork, rewarding critical thinking, and ensuring that kids get their heart rates up. We’ve very proud to be a part of the Vernon Hills community and invite you to stop by and see us at 960 Woodlands Parkway. You can also fill out the form on this page and let us know about your interests, or simply give us a call at 847-239-5697. We look forward to hearing from you!